Hold those moments in your heart. Be different by making a difference. 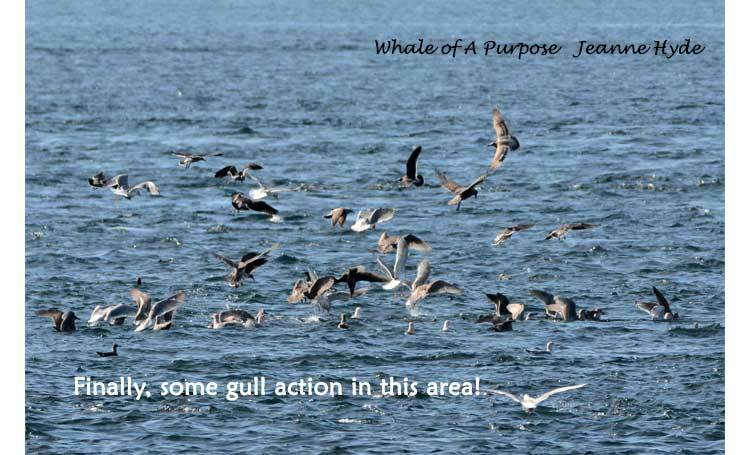 Consider your actions - are they good or not good. 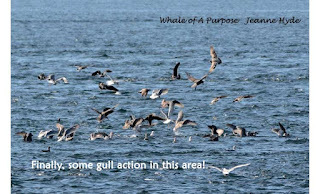 Each day decide to take an action to help this ailing earth. What you do, others will repeat. Take your worry, sadness, fears - change them around. Turn worry into action for good. Turn sadness into smiles for others. Turn fear into challenge to make a difference. Now let's make 2019 a year of positive energy and positive change for the good of all beings and especially the Southern Residents. After all, they are the ones who drew us in, in the first place. 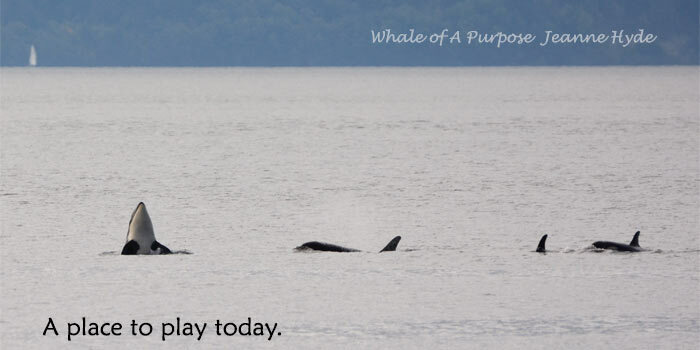 It's time to give back to them, so they will be here for future generations, theirs and ours. I post this each year. Enjoy. 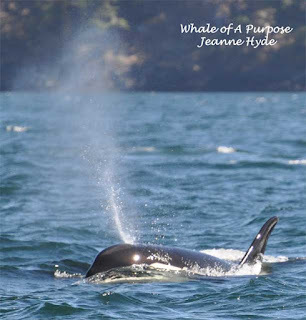 ...SRKWs over the hydrophones early this morning!!! 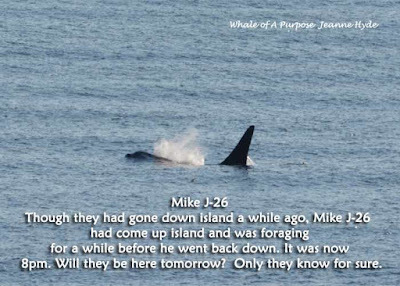 ...early morning about 05:30 on November 22nd I heard two very faint calls and that was all...the first call sounded like a Resident but the second sounded more like a Transient - so much for that! Later I heard from a friend on the west side that they had heard whales exhaling a bit earlier than when I heard those extreme faint calls...but there was no way of telling, who, what, or where! 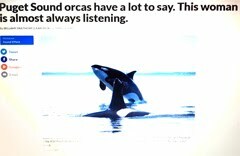 Keeps one listening for more information! Did you listen to the whole 2+ minutes? ...if so, what did it bring up for you? -being thankful to be able to hear the sounds of the sea. If you didn't listen to the whole 2+ minutes, what is it that took you away from hearing this being of the sea? 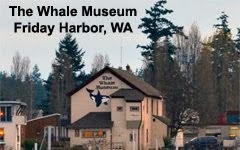 ...a woman told me that she had walked along the path from the parking lot to the 'wall' (at the south end of the park) not thinking she would see any whales - you know there is a sign that points to that path that says something about whale viewing...(ha-ha)! ...well, she is now officially spoiled...because no sooner did she get there is when the two 'big boys' surfaced right in front of her!!! 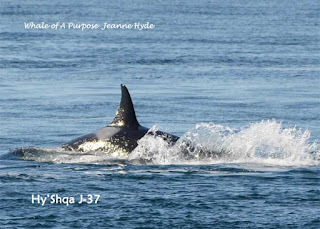 This is from July 26th of this year..
T'ilem I'nges J-49 was close to shore and echolocating...with 'flair! 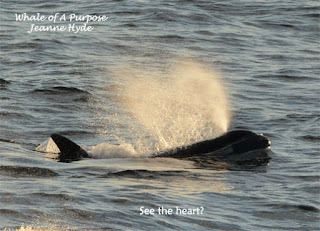 ...What's it like to sit on the shoreline and watch whales for hour upon hour? ...Amazing is what it is.. ...Being September, it's been more quiet of boats. 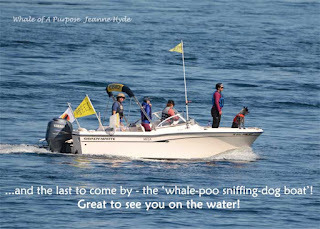 ...Private boats have been more respectful when the whales have been present. Thank YOU! It's wonderful to see more awareness. 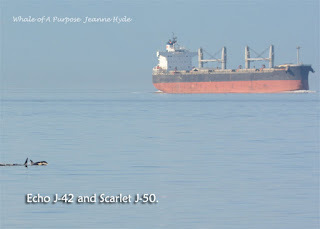 ...the tanker, bulk carriers, etc. who are participating in the ECHO Program - a voluntary vessel slow down are also slowing down, which in-turn reduces the noise, which helps the whales when foraging...Thank YOU! 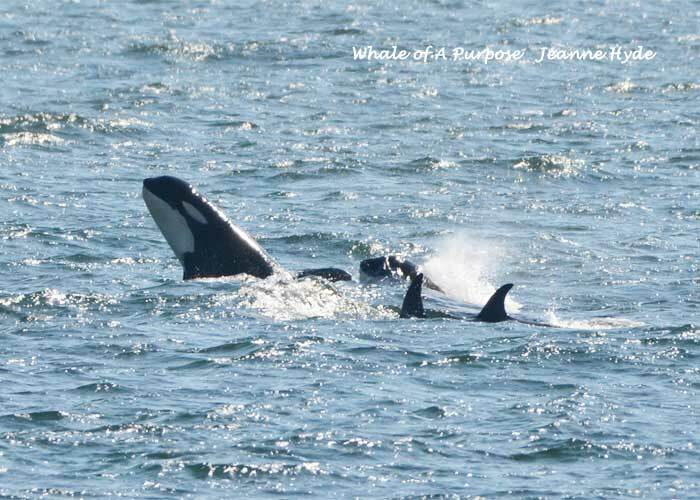 ...the people who come to visit are asking questions, not questions like 'when do they breach' but questions that reveal that all that Tahlequah J-35 went through, was not for naught, but that she 'spoke to the world'. Thank YOU for caring! ...I thought it would be a pass-by, maybe an hour. ...It was a forage and stay and goof-around day. ...How about for 4 hours. ...Yes, for 4 hours they were there. ...It is not easy sometimes, to let go, but today was the day. 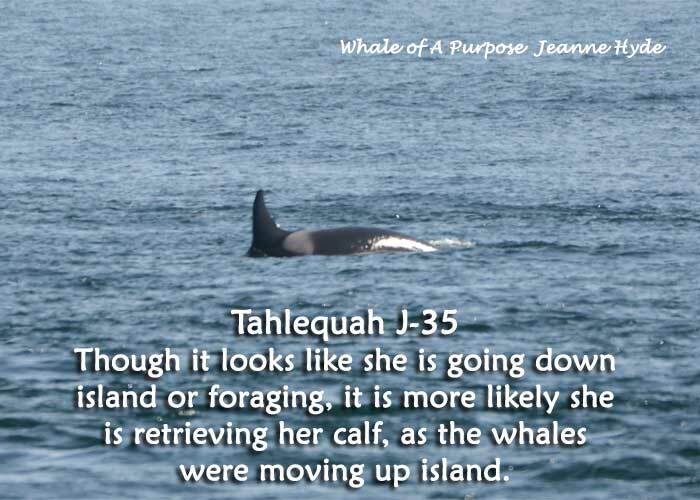 ...It is time to let go of the sadness of what Tahlequah J-35 went through. 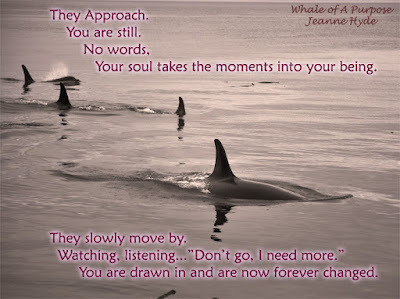 ...We bring you moments of just being one with us. ...Now please don't let us down. ...We need you humans now more than ever. ...There are 74 of us, and we need everyone of you humans to help us. Today was a gift, as it is each time we are in their presence. Today was an example of how it can be. Today was a message to all who saw that each of us can do better. 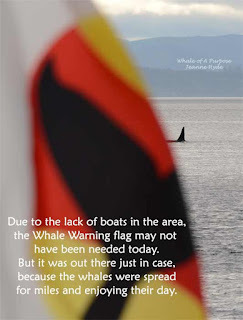 And when it is for the whales it will ultimately be for us. So go be a better steward of the land and sea and skies. 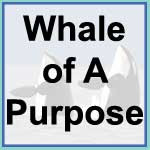 Everyday ask yourself, "what will I do today to make a positive difference?" 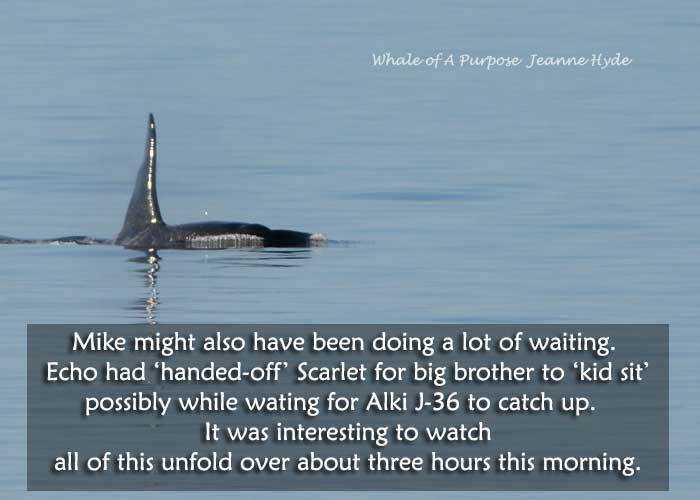 I learned today, September 13, that it has been announced by the Center for Whale Research that Scarlet was last seen on the day mentioned below. At that time I had to hold on to hope. But now that hope is gone. 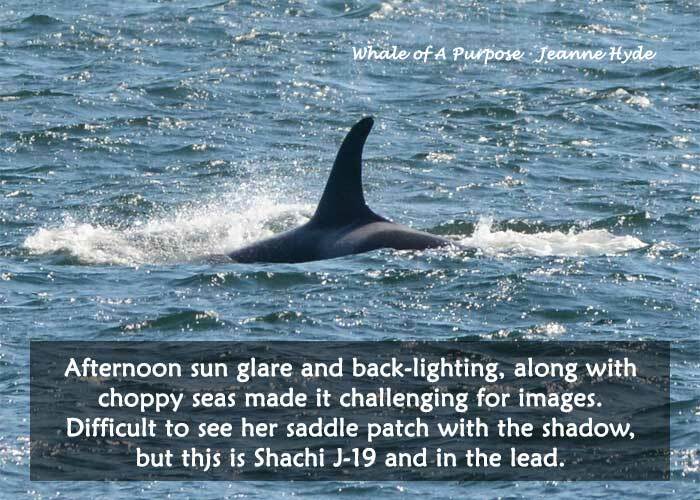 With tears streaming down my face, I am glad she is no longer suffering. 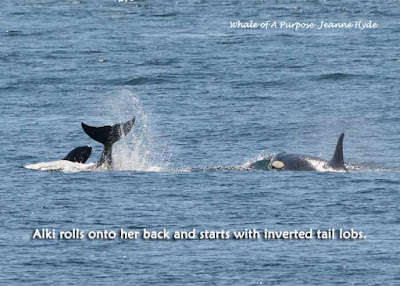 She was such a fighter, right from the very beginning. As sad as I am, I am glad your suffering is over. You taught us all, to continue on, to not give up until there is no other option. We all must keep on doing all we can to restore this community of Endangered orcas. Scarlet, you gave us such joy when you were in our presence. 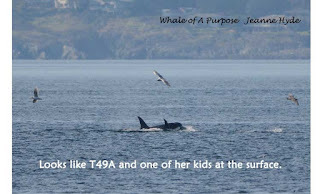 I cannot begin to image the loss your mother, brother and sisters, especially Echo J-42 must feel. Below was written on September 7, when I still had hope. 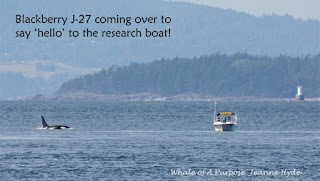 J Pod and many L Pod whales had been north for a couple days...they came down last night...likely via Rosario Strait. Earlier there was a large group of Transients who were coming down ahead of them and they were looking like they were aiming for Rosario Strait. 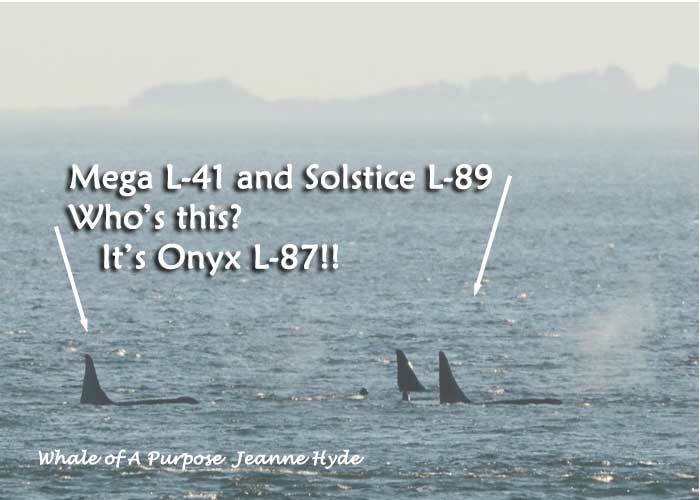 Later, J Pod was in Boundary Pass and to us humans 'that means' they'll be coming down to Haro Strait sometime in the night and passing by the Lime Kiln hydrophones...NOT! 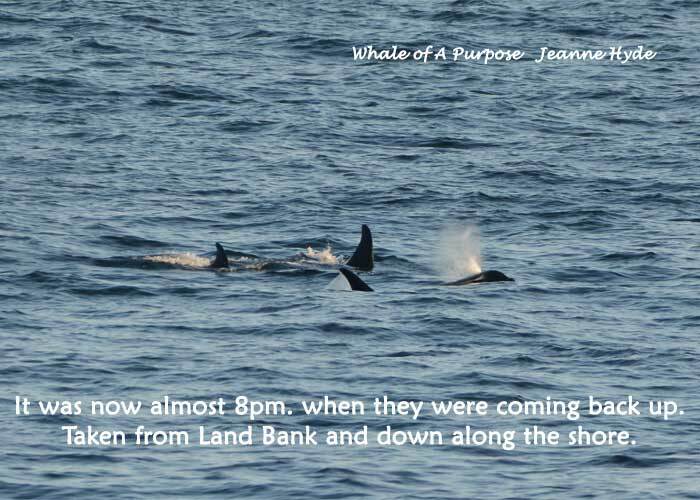 ...instead of hearing J and L Pod calls in the night I heard Transient calls! 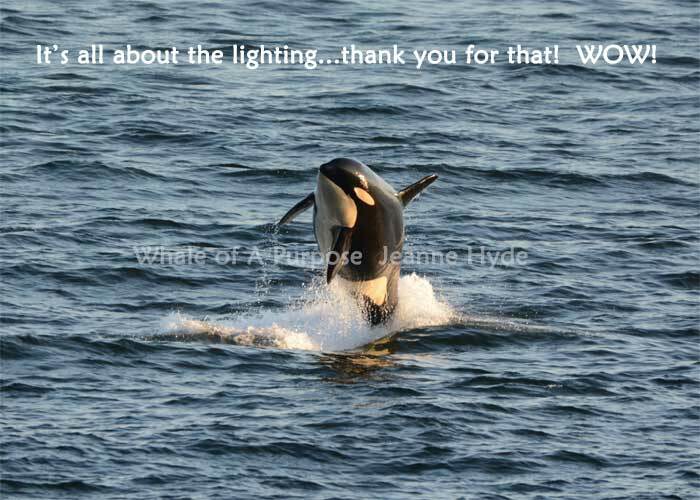 ...inside talking to folks and based on info I had the whales were still coming up island...NOT! 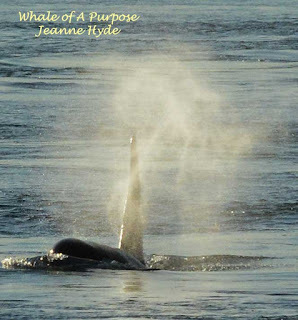 ...hearing one call on the hydrophones I chased everyone, including me, out the door! Oh, my they're here already! 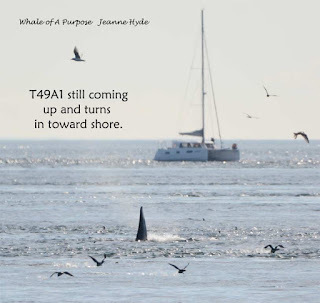 ...the whales were spread, moving quickly with the current...Cookie J-38 was chasing a fish...Moby J-44 chasing a fish...and others were too! ...I know she is not 'out of the woods' yet...but they were together, sometimes spread and sometimes close...but still together. 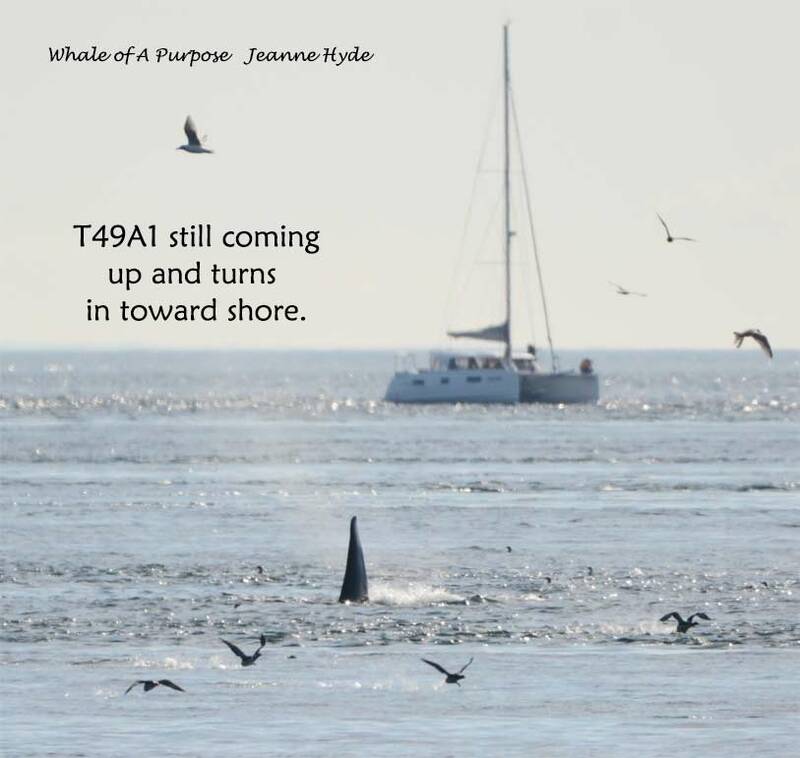 9-3-18 They Came Back In! J Pod had come in late on August 31st and went went up island in the early hours of of Sept. 1st. ...as they ate their way up Haro Strait...I heard that they did this most of the day as they kept on going wherever they wanted to! ...in the early morning a FB post stated that hope was fading for Scarlet J50 because she hadn't been seen in the last two days - that's two whole days of many, many eyeballs searching for her - the mystery got even greater!...because Odyssey (whale watching boat, out in the early morning) thought they saw her with her brother...Soundwatch and CWR verified that she was here!!! Oh, my...did I ever get on social media to 'shout it out' that Scarlet is still here !!! WOW! 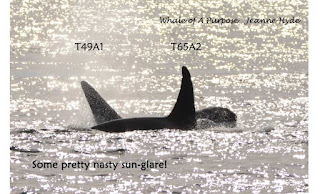 ...it was early afternoon when the whales came up island...and in a tight group was Scarlet in between her mother and brother, surrounded by the J17s, J11s, and J22s, all passing by together...oh, my! 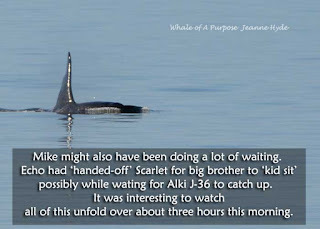 ...glad but cautious...Scarlet has a long way to go...hoping all is successful with the Response Team doing all they can to help her. 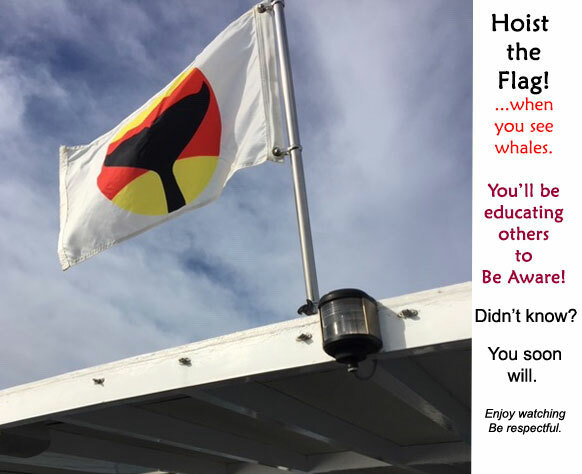 while you're at it, ask yourself, "What can I do differently to help affect a positive change to the eco-system, the one here and where you live?" What changes are you willing to make? It takes everyone to start doing things differently. 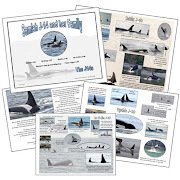 8-30-18 News Came Today !! 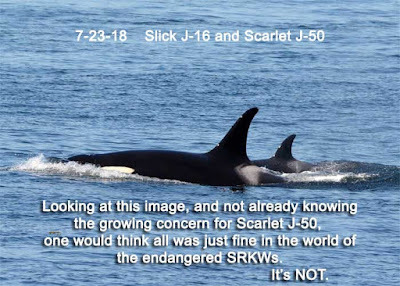 8-15-18 Are You Doing Your Part to Help the SRKWs? Lots has gone on and I am sorry to have missed so much. 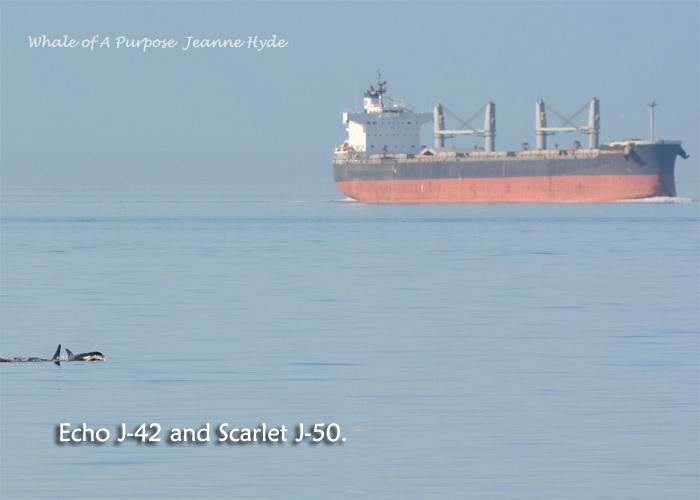 I am thankful to NOAA for posting updates on their FB page: NOAA Fisheries West Coast regarding Scarlet J-50. Also the Center for Whale Research reported the day that Tahlequah J-35 and the rest of J Pod returned after being out toward the outer coast for a few days, that on that return, they stated that she had let go of her calf and was seen with a few others and looking well. Which is it for you? 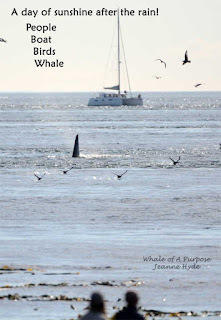 I hope 'the whales got you', because it will change how you look at everything from now on, and that is something that is sorely needed for the environment now and into the future. ..and for this whale watcher...no more stress, no more worry, slow down and enjoy every moment, because when your back says, "No more!" ouch!...it really hurts. 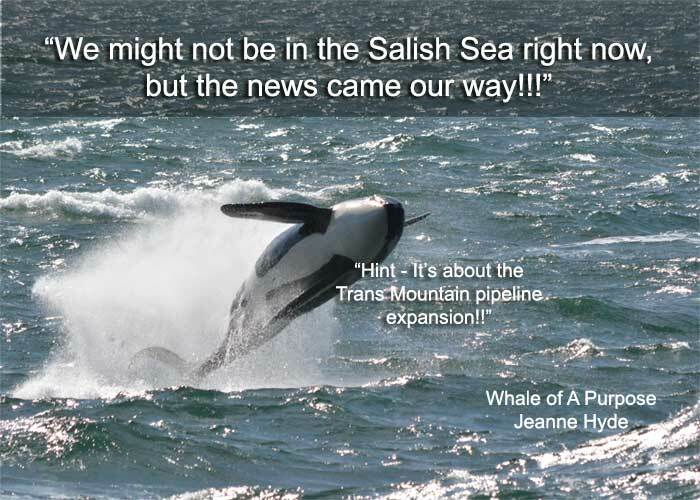 If everyone would pull together, everyone acknowledge their part, or what could be their part, in the struggles regarding the SRKWs, and if everyone would agree (that's a tough one), then just maybe we all could turn this corner for a brighter future, not only for the SRKWs, but for the eco-system (ours, yours, and the whales), and the salmon who sustain it all. 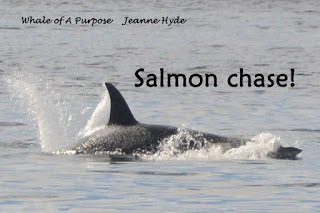 Salmon are the backbone of the Salish Sea and the Pacific Northwest. Even before moving here in 2004, I had heard that the SRKWs were referred to 'as like the canary in the coal mine'. -And now they are the 'canary'. 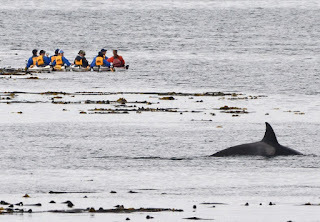 The SRKWs had been demonstrating, by their travel patterns and locations, that the wild salmon were declining, but it seems that little attention was paid to the plight of the whales. -After all, they were still showing up in these waters. 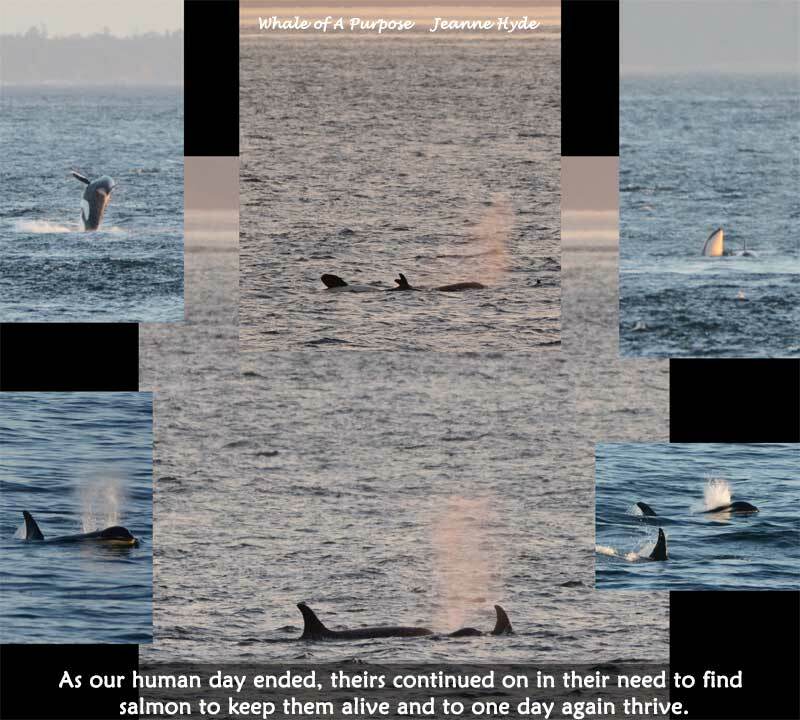 In 2010, the sockeye preseason predictions were for a 'moderate return' of 3,000,000 sockeye. 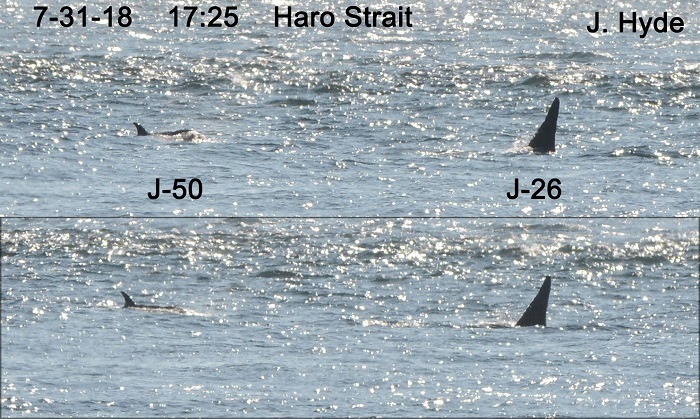 Three months later it had proved to be the largest sockeye return in 97 years - the number? 34,000,000. 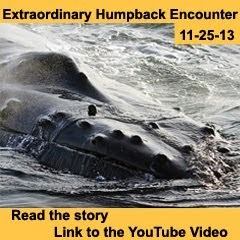 (The whales were here over 120 consecutive days.) It was anticipated that with a 4-year cycle, the 2014 could be even larger. -But it wasn't. It was below the lowest predicted return numbers. 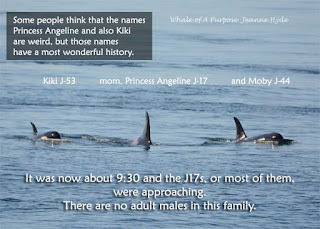 Then Dec 2014-Dec 2015 there were several babies born into the SRKW Community...and 'all of a sudden' everything was 'just fine'. -But everything wasn't 'just fine'. 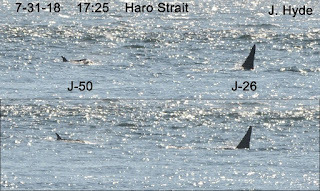 Now the SRKWs are barely in their core-summer-habitat. 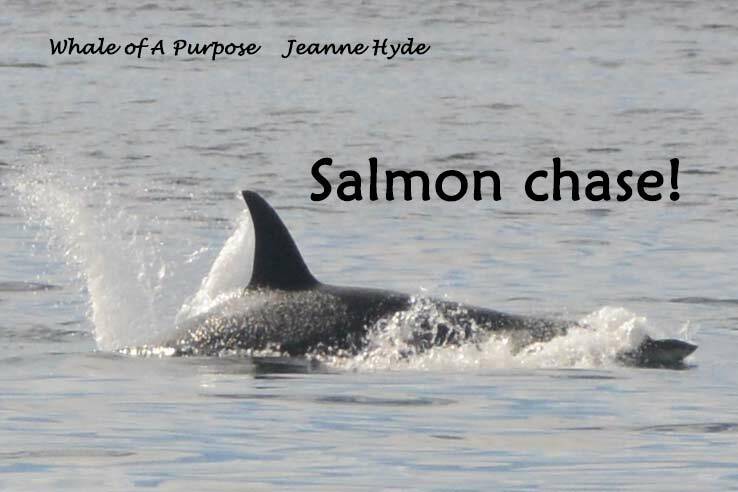 Wild salmon are the Backbone of the Salish Sea. -Waiting to make decisions is NOT a viable working model. 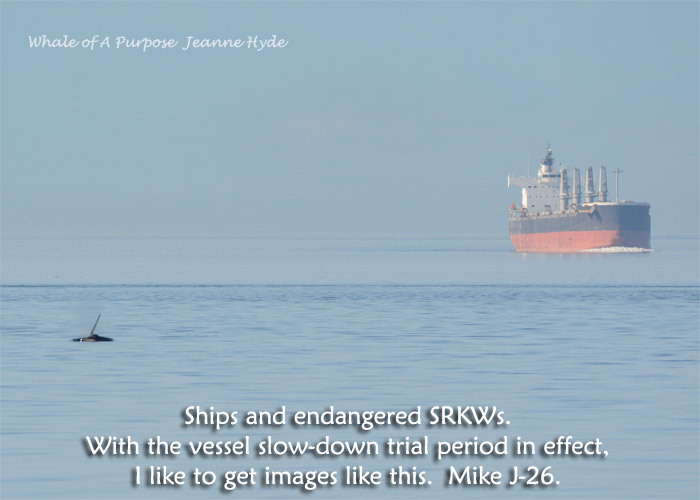 Waiting, begets more loss, more decline...and now on the road to extinction for the SRKWs? The Salish Sea is broken. It's broken in Canadian waters. It's broken in U.S. waters. It needs to be fixed before it's too late. Too late for the SRKWs. Too late for the wild salmon. 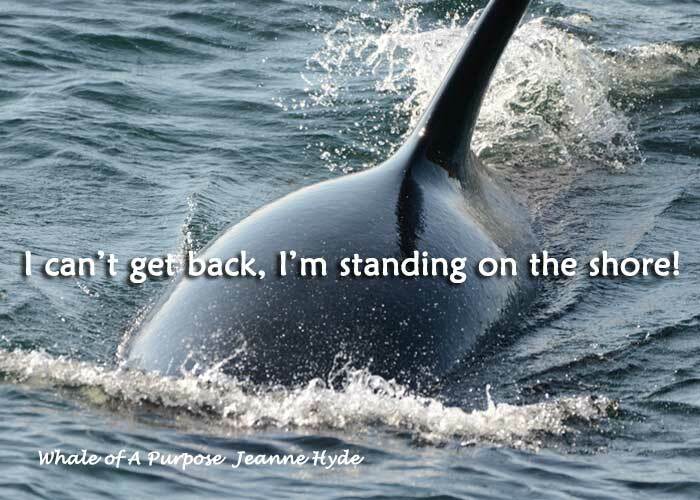 Too late for all other marine life. 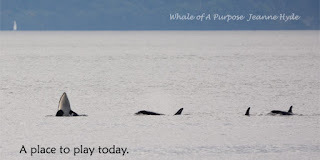 What are you willing to do everyday to make changes that will help planet earth heal? The government isn't doing it, so it's up to each of us. You've seen the lists, links, about things you can do. Start doing them and do more. Vote for those who see the value in thinking into the future while actively fixing the present. 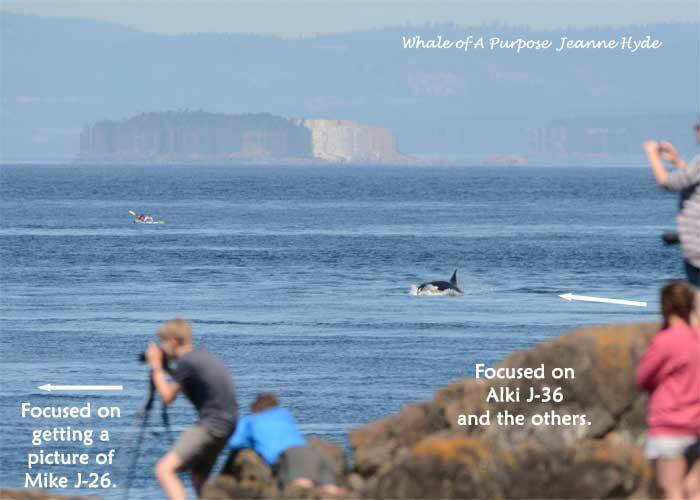 Here is an image taken of Slick J-16 with Scarlet J-50 by her side, as they passed Lime Kiln lighthouse, on July 23rd. I thank them for giving us this look, a look that will not reveal just how bad Scarlet is. All of J Pod took all day, yesterday, to get from the Strait of Georgia to Haro Strait...being heard over the Lime Kiln hydrophones at about 1:00 a.m. 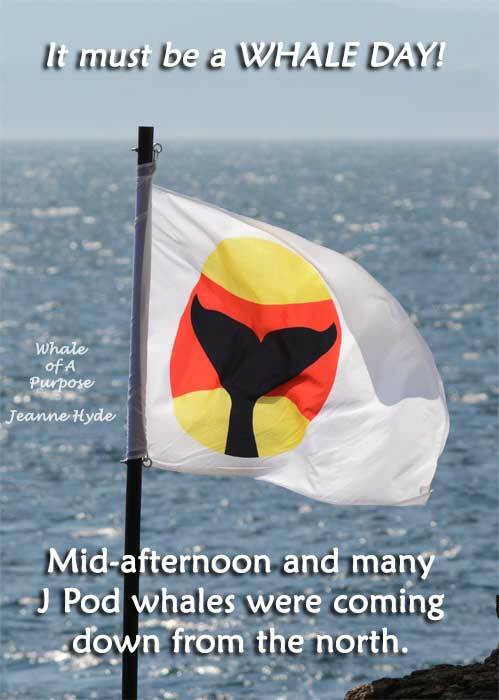 This morning the seas were choppy, the wind was strong...and where the whales were remained unknown until late in the morning. 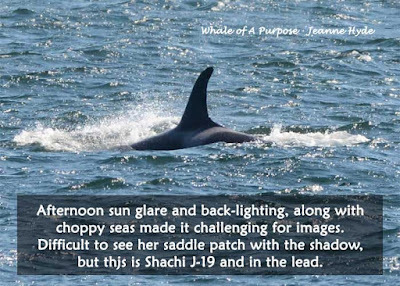 They made their way up island, the leading group, by about 5pm...the seas were still choppy and the wind wasn't as strong, but the sun glare was providing for many back lit images. 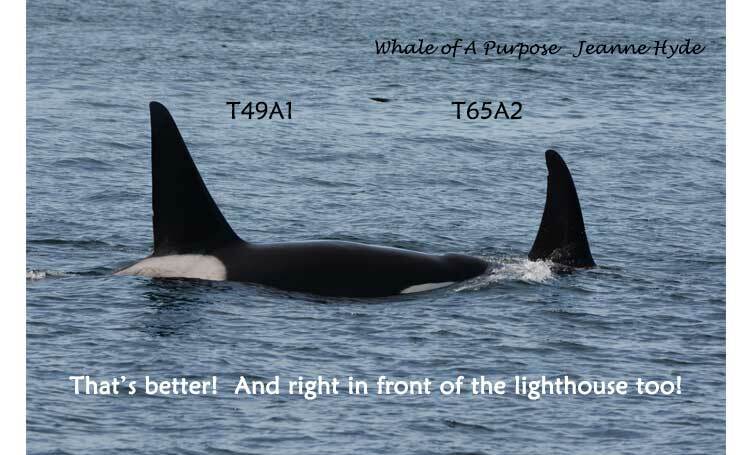 They were spread out, moving quickly with the current, the and lighthouse was in my way...so I ran from one side to the other to get pictures...I would look later to verify just who was in my images, but for those moments it was to get them on the camera. 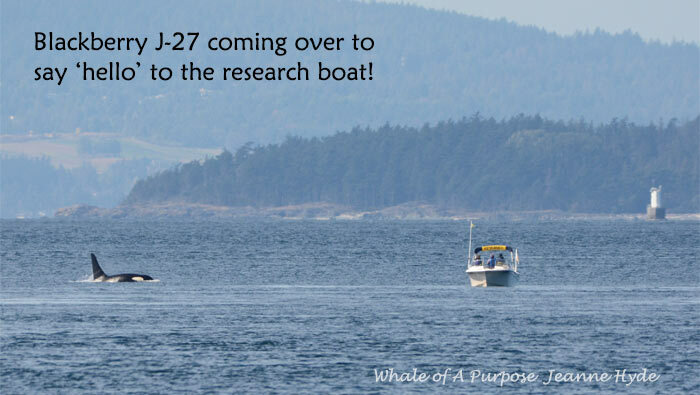 Tahlequah J-35 had not been seen yet, so that was the 'mission' to get her in an image...mission accomplished. 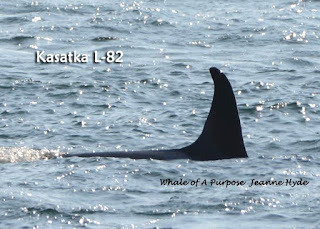 The L12s were evidently here...but one of the first whales to go by was Kasatka L-82 and that was a surprise! 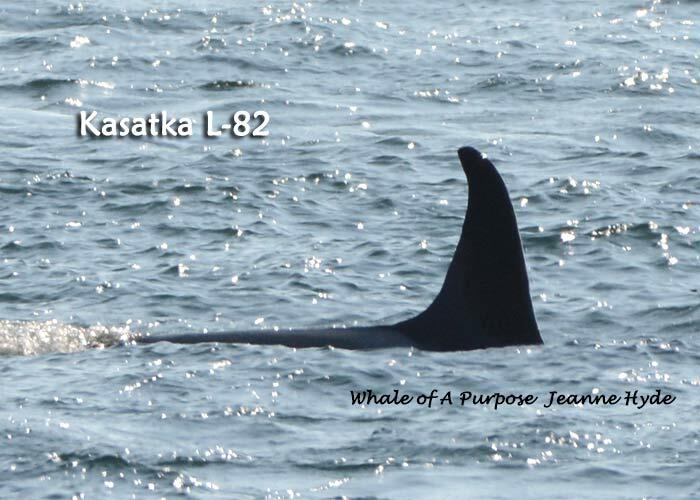 Seeing Kasatka meant that the L55s were here, at least, and they travel with the Ballena L-90, the last surviving member of the L26s. Also should be Surprise! L-86 and her offspring, the L47s - Marina L-47 and her family members, the L72s - Racer L-72 and her offspring Fluke L-105. 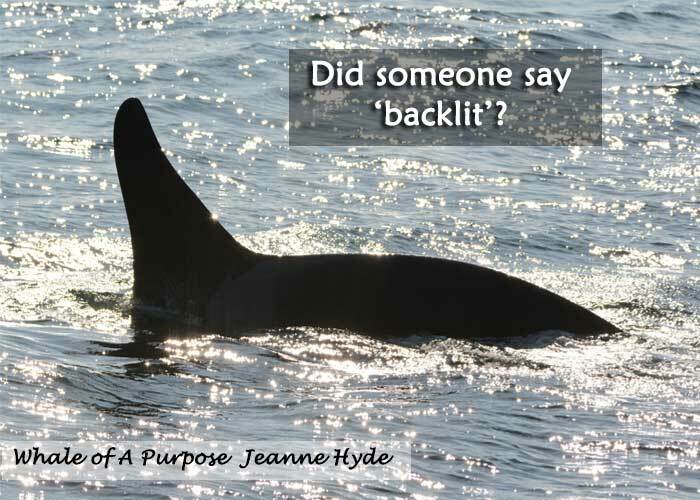 Many of those showed up on the backlit images. 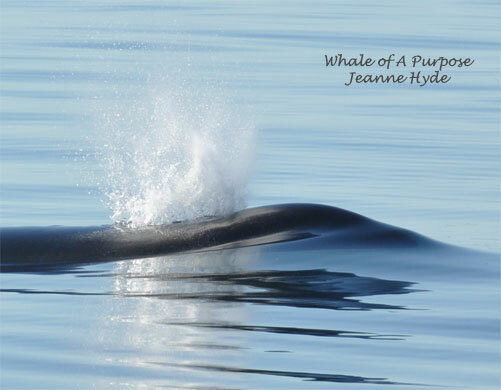 July 31st is the ONLY day L Pod whales have been in Haro Strait in the month of July. 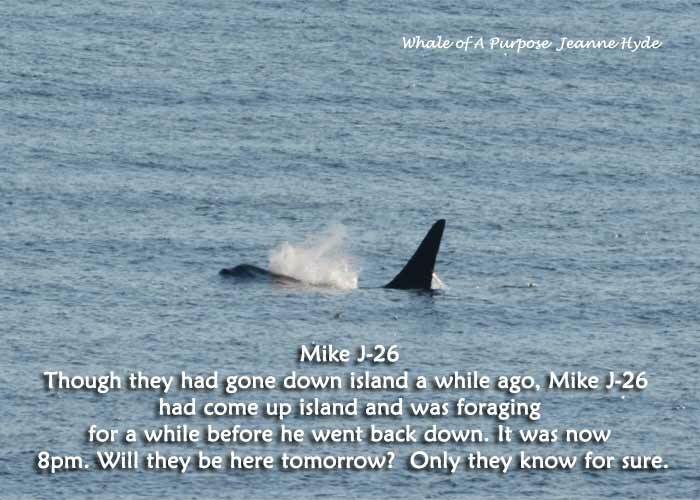 Glad they are here. 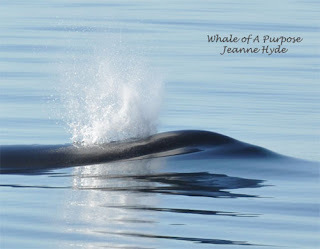 The whales were mixed, Js and Ls, some in very close to the shore. 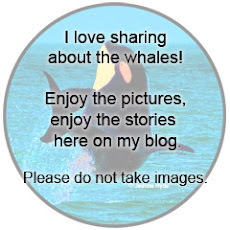 Dr. Otis' two interns, Amanda and Sarah, had the opportunity, since it was past the documenting hours (daily 9-5), to get all the way down on the rocks with the hope that some of the whales would come in close...the smiles on their faces gave the answer to that! 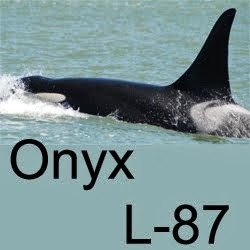 ...it was interesting to see Onyx L-87 with the L12s, with them being so far behind the others. Interesting to note that over the last year, Onyx has spent a great deal of time with Tahlequah's family. 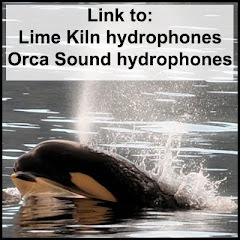 At 9:15pm calls were heard over the Lime Kiln hydrophones...okay, so the L12s are coming back down. But since I wasn't there I could not confirm...that is until I get a message from a friend who was at the lighthouse and who knows what Mega L-41 looks like..."Mega just went by!" was the exclamation!! 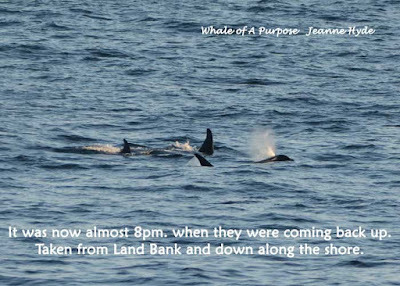 So as the day came to a close, J Pod was north, Tahlequah was still carrying her calf, at least some of the L12s had changed direction and went down island. In addition to the many questions regarding Tahlequah, a new question has been added regarding Onyx. Who will he be with next? 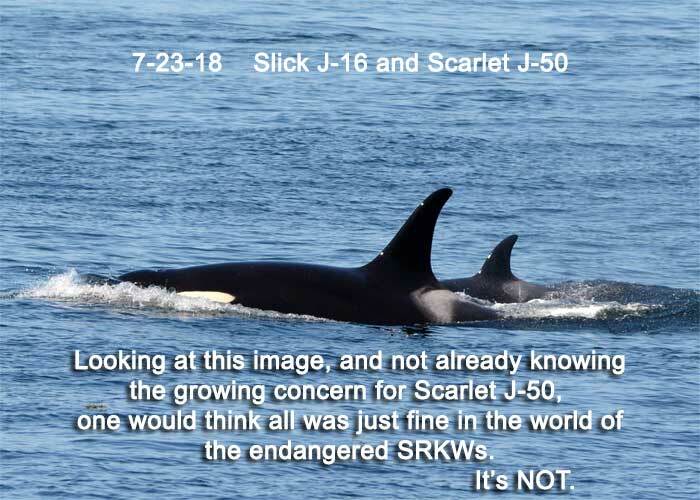 The concern for Scarlet J-50 continues. 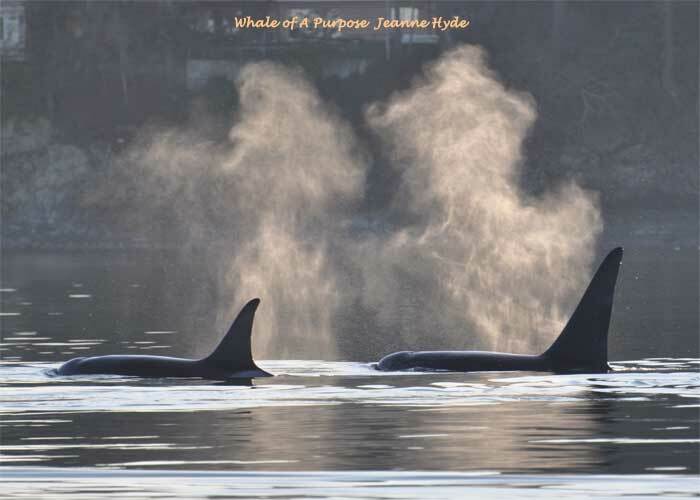 With the backlit issues today, it was tough just getting images and tougher figuring out who is who...but here's Scarlet with her big brother Mike J-26. 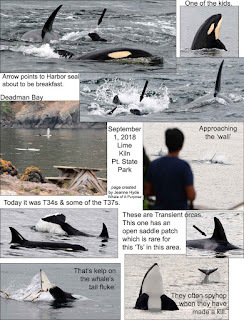 7-29-18 Is It Back-to-Normal for the Whales? 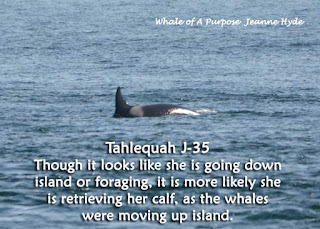 Today, Tahlequah J-35 continued to carry her calf. 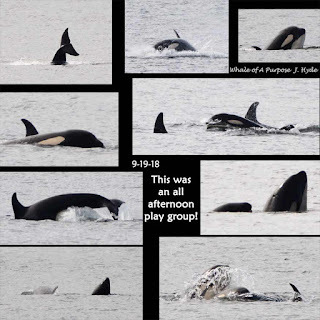 Today the rest of J Pod returned. 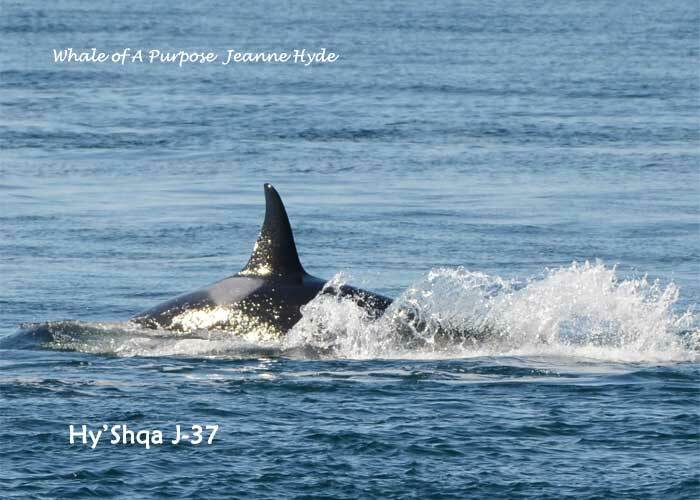 Tahlequah's family came down Boundary Pass and into Haro Strait. 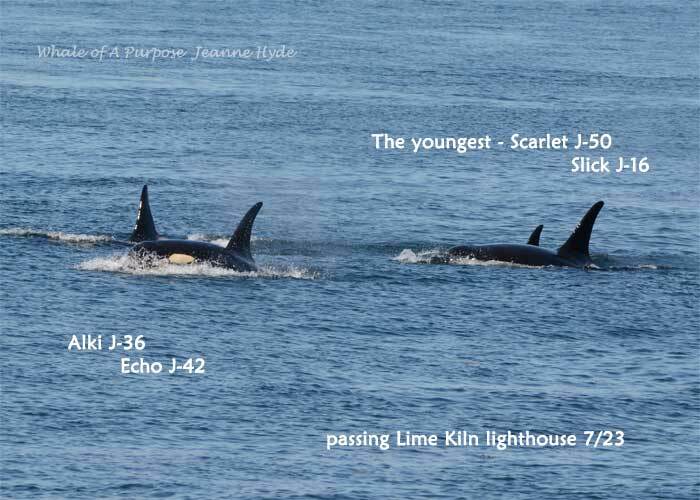 They passed Lime Kiln lighthouse, going down island. 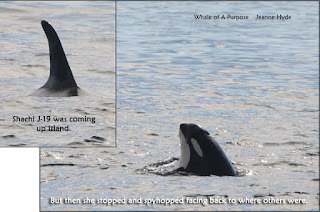 The rest of J Pod came up island at the same time. 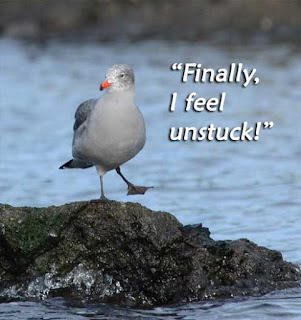 The feelings of relief came over many of us. 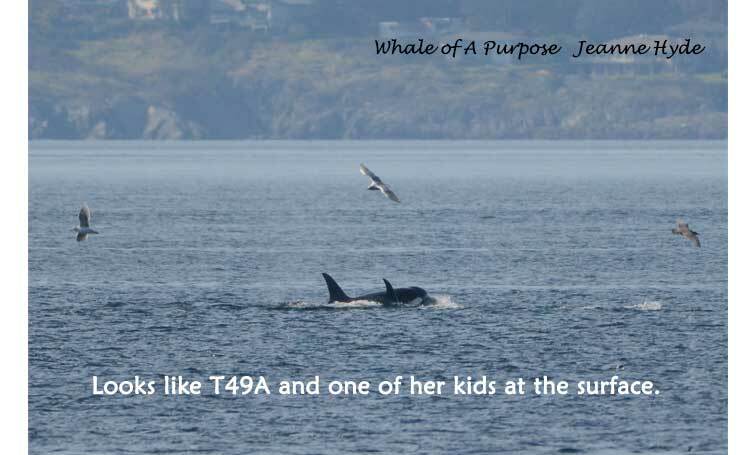 Their family was back together, at least for today. To witness them joining back up was heartfelt. Is it over? Will things get back to normal? What is 'back to normal'? Normal is having enough food to eat. Normal is having healthy babies, who will live a long life. Normal is having space to live their lives. Normal is freedom from stress. 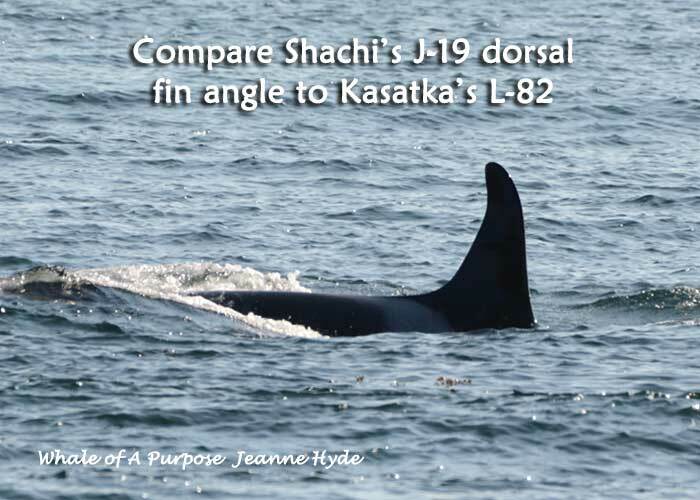 Begin to look at these whales of J, K, and L Pods differently. They have given the humans an opportunity to understand. 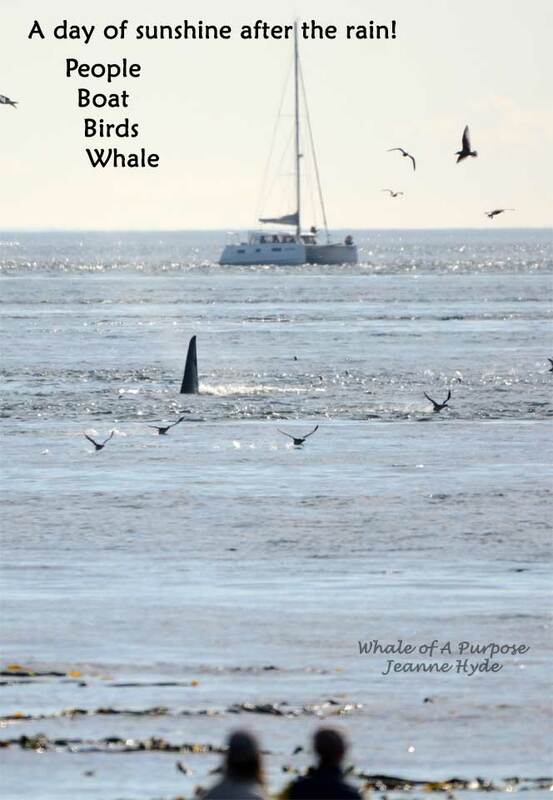 Respecting our neighbors, means respecting the whales and their aquatic world. 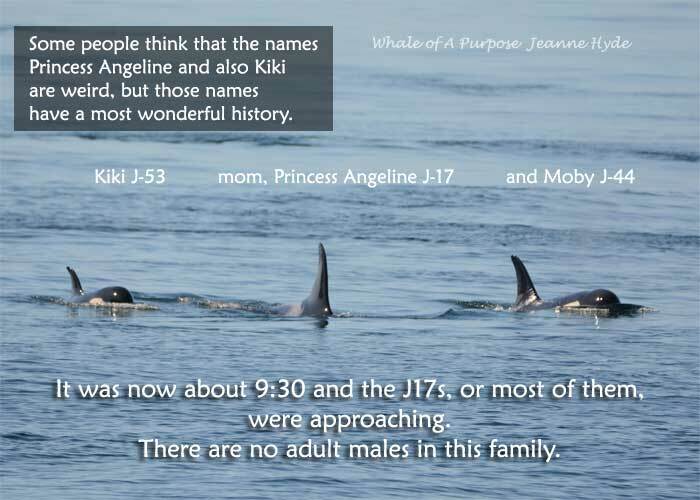 Celebrating these orcas is a privliege and not a right. 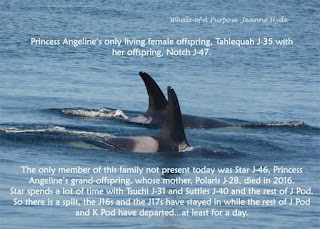 It was learned on 7/24 that Tahlequah had a newborn and the baby died. 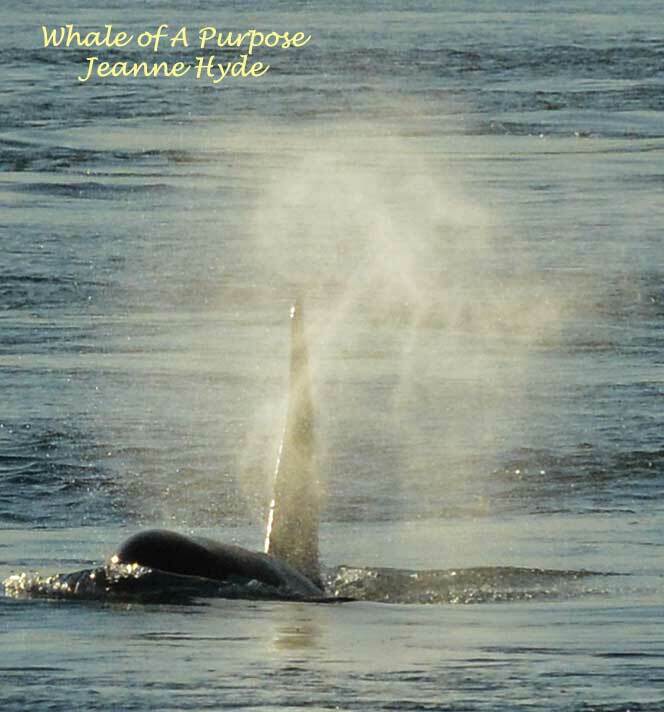 The Snake River may be far away but holds a major key to restoring wild salmon runs. 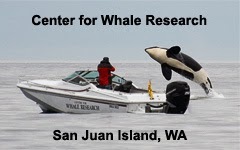 The SRKWs don't have time for more studies. They can't eat studies! 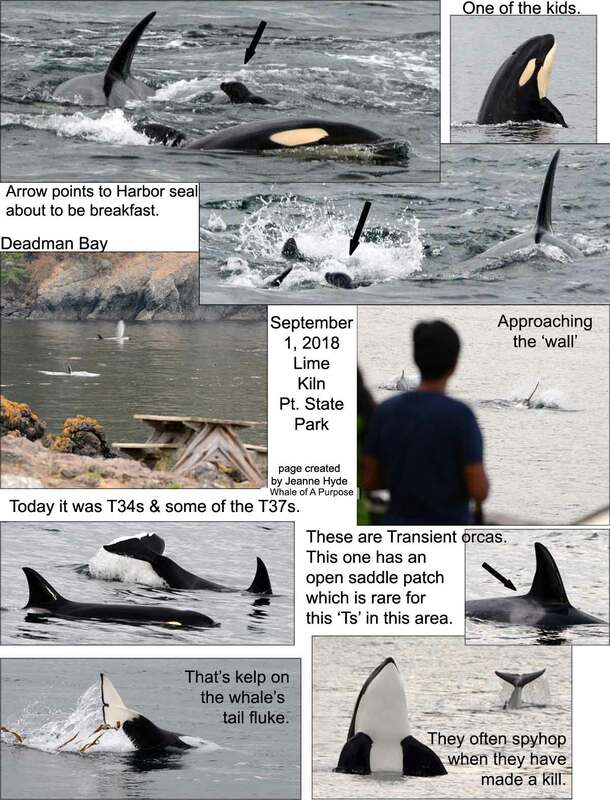 Take action, call your elected officials to get the dams breached. so...I guess they were the ones making all those calls the other night! ADDED 7:25 a.m. MAYBE NOT! 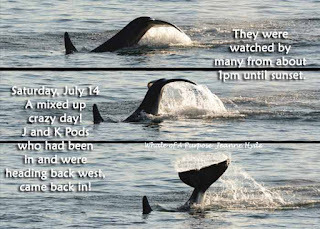 Lots of J and K pod calls in the early, early hours of the morning on 7/24! 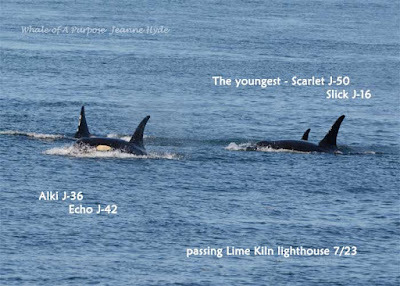 And the Albion numbers are moving up...Chinook and Sockeye!! Only the 10 J Pod whales who were present yesterday, were seen today. 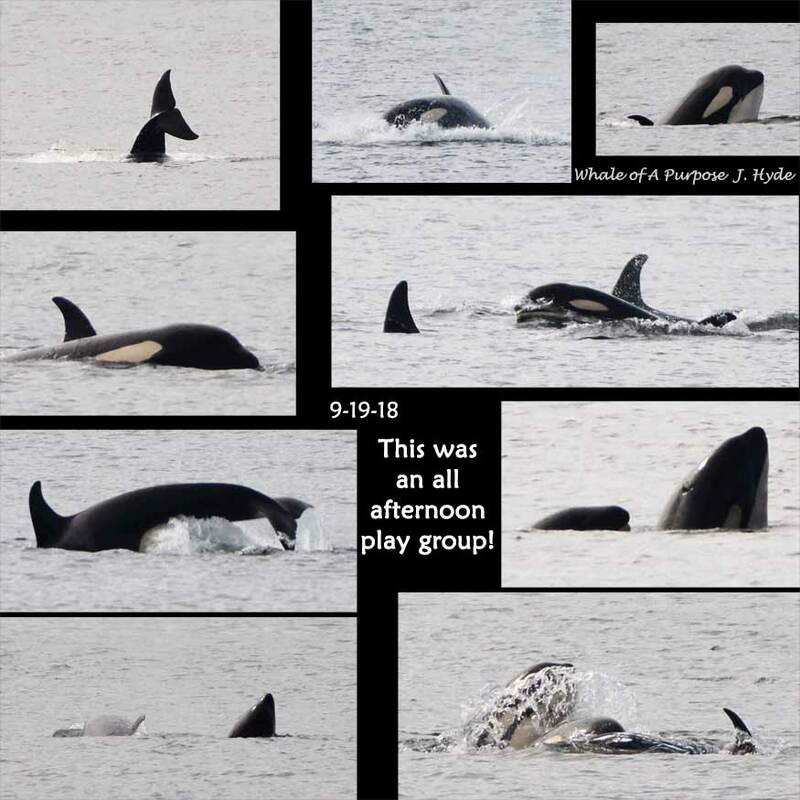 The J16s and J17s spent their day traveling southeast the Strait of Georgia, passing Pt. Roberts and heading toward Rosario Strait late in the day. 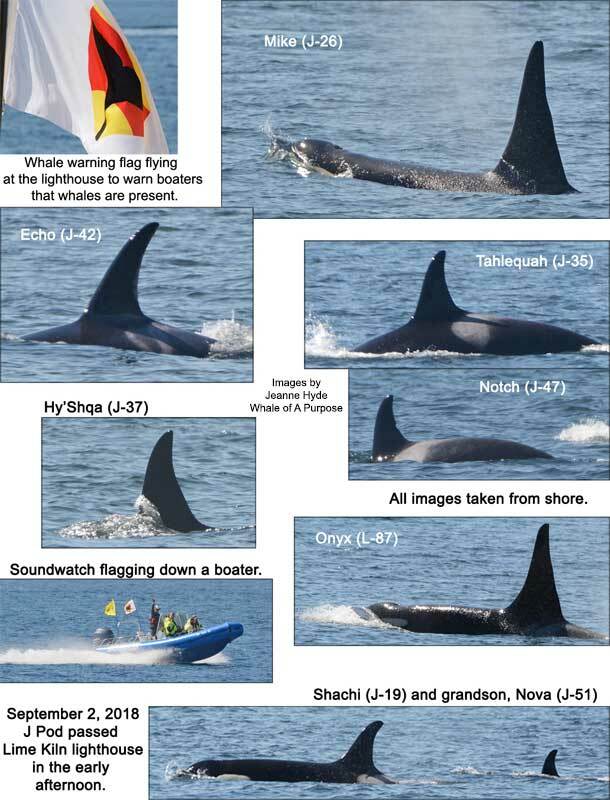 The 10 SRKWs who have been in the Salish Sea, had evidently come down Rosario Strait in the night because they were seen coming up the west side of San Juan Island where they spent most of the day between Eagle Pt. to just north of Lime Kiln. In the late afternoon, after they had passed Lime Kiln and were at Andrews Bay, to the north, other whales - K Pod whales showed up, totally unexpectedly. No one knew they were 'in', likely because the seas in Juan de Fuca were rough. 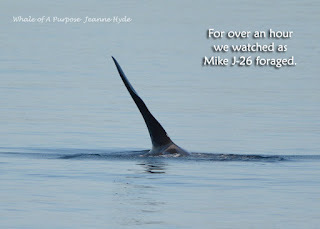 The whales present now totaled at least 21 (some Js and some Ks) and all went back down island. They could be heard over the Lime Kiln hydrophones until about 22:45, until drowned out by ship noise. Today the total # of SRKWs was 24. 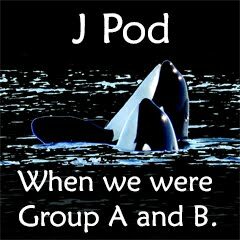 All of J Pod and one L Pod whale who travels exclusively with J Pod. The K Pod whales who were here yesterday were not seen anywhere today. 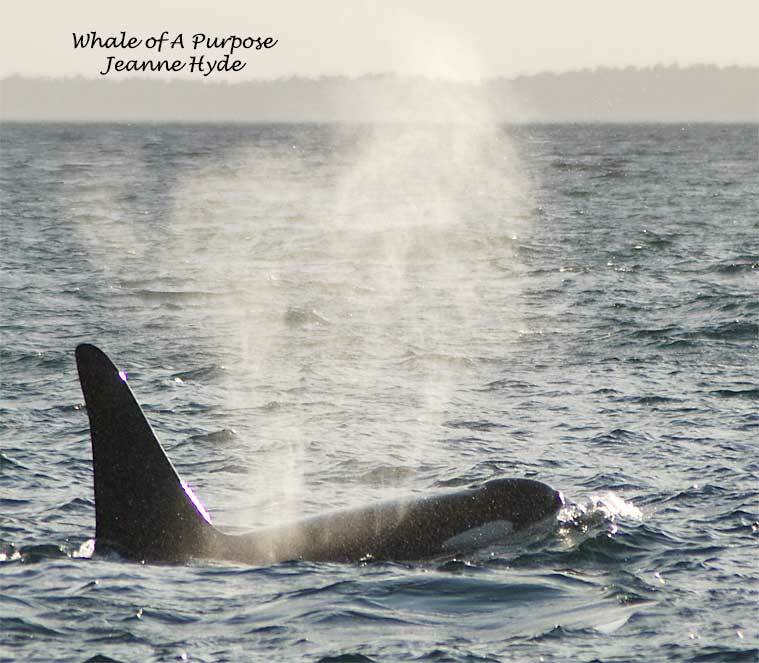 The whales were in Haro Strait all night on the 17th, and into the 18th, the majority of them heading north towards Active Pass. 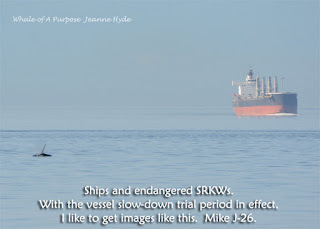 There was a small group of five, who stayed along the west side of SJI. 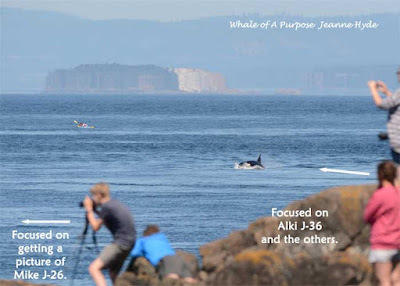 Of those five, three had come up island passing the lighthouse in the morning with the all of J Pod, except Blackberry J-27...but then, about an hour later, the three - Tsuchi J-31, Oreo J-22, and Cookie J-38, left the large group and came back down island to where Blackberry J-27 and Onyx L-87 were. 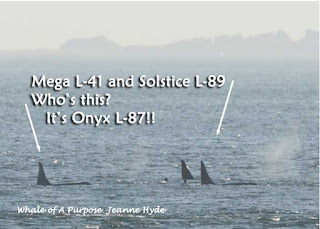 Late in the day they came up island at about 9pm and could be heard over the Lime Kiln hydrophones until around 11p.m., (while I was writing this post) Onyx L-87 continued vocalizing his distinctive call well into the distance. 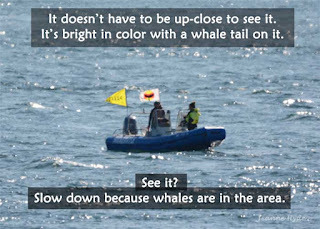 ...interesting to note...when he did this before it was like he was calling out to others, perhaps other Ls...and the following day it showed that maybe he had, because when he was seen he was with L Pod whales incoming - that was a few years ago...still gets one to wonder...so we shall see what, if anything, occurs. Are they splitting and mixing in order to find enough food? 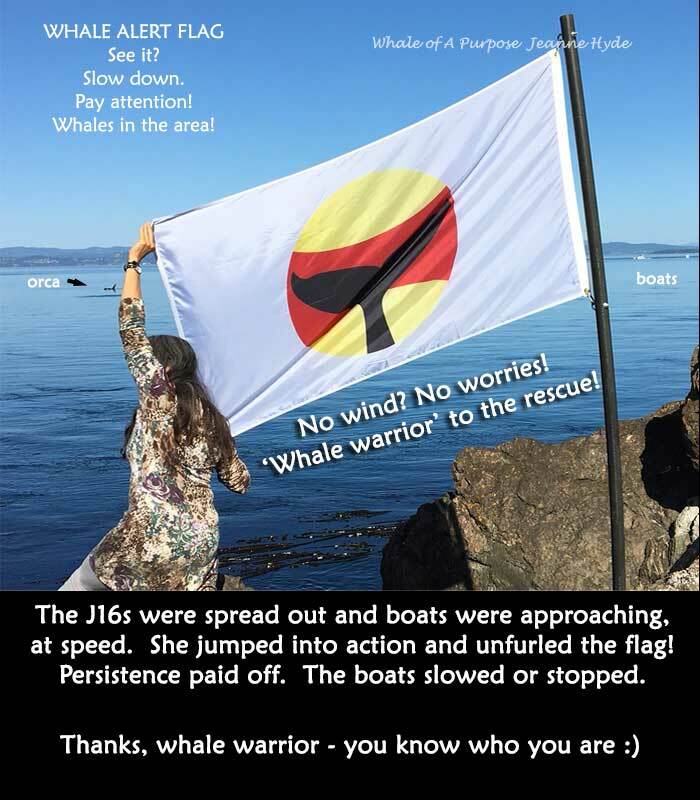 ...and today a new addition the Whale Warrior!!! The more people who know and understand the better the chances are of restoring not only this population of endangered SRKWs but also the ecosystem that needs so much attention to recover. 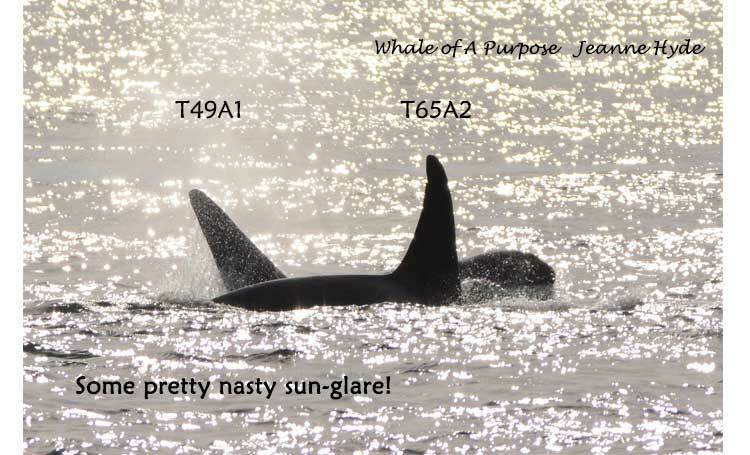 ...observation...just the two family groups of J Pod in here today...one adult male, 4 adult females, 3 juveniles between ages 8 and 11, and 2 under age 4. 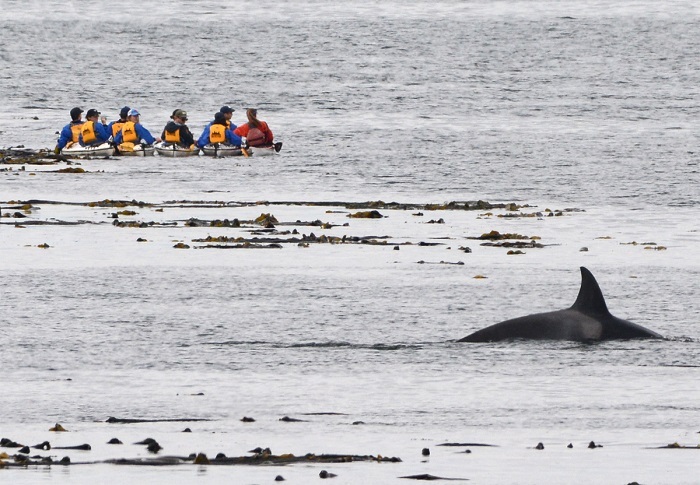 Perhaps with this small number they might have a better chance at finding enough salmon. Maybe it's for another reason.